You know what I love about pumpkins? Everything. They happen to be the best color in the world (there really aren't enough people in the world that have orange as their favorite color), they're super yummy, they're nutritious, you can decorate with them from August through Thanksgiving and no one gives you weird looks (well...usually), and they are just fun. 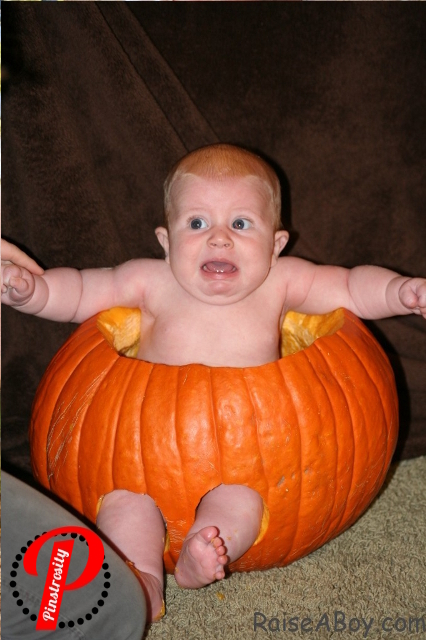 We had two submissions the past little while that included pumpkins, photos, and some very unhappy babies. I knew we had to get them up on here. Oh those shots make me chuckle. If we could only find a way to communicate with babies just how cute of a photo it will be and how much they'll love it when their older (especially when those photos are pulled out to show their dates, hehehe). Take pictures when they are happiest. Does your baby wake up super happy in the morning? Take the photo then (even if you are still wiping the sleep crusties out of your eyes). Have an afternoon baby? Take the photos then. If the baby is already happy, the picture will be a lot easier. Have the prop/area warm. Now I've never sat in a pumpkin before, but I'm trying to imagine it. I'm imagining a slimy cold pot that I can't get out of. I think I'd probably react the same was as the babies in the pictures. There are things you can do though to help minimize that. Let the pumpkin sit in the sun for 20 min. or so before trying to take the picture. Put a blanket (that you're okay with getting messy of course) in the pumpkin first and then put the baby in it, tucking the blanket out of site around the baby. I think this is what they did in the 2nd picture of the Original Pins. If you look at the left leg, you can see blanket or clothes there by her leg in the pumpkin. Sometimes it's just the initial displeasure of being messed with that gets a baby upset for photos. Sometimes the baby is unhappy at first when you put them in an item (a small crib, a scarf, a pumpkin, etc), but they may settle down after a minute or two. If the baby's unhappy at first I will usually try to rock them in the item and talk to them. This can calm them down...it can make them more upset. There's no clear cut equation with babies and pictures. Have everything set up before hand. Have the pumpkin in place, the blanket in the pumpkin, any other props you want, a heater if need be already blowing warm air on the pumpkin, the camera set on a tripod, etc. The more you have set up, the less time the baby has to just sit in the pumpkin awkwardly while you get things just perfect. Those tips may help...but they may end up not doing any good for you. I don't have any babies of my own yet, but one thing I can predict about every baby is that it will be unpredictable. Just be patient and be willing to try again later when the baby's happier; you may end up with the perfect shot the next time...or you may find out that your baby hates pumpkins with a passion. We recently took pictures of our toddler son dressed up as Dilbert for Halloween. This didn't require sitting in a messy pumpkin, but it did mean wearing play glasses and a curvy tie -- two pretty unusual things. We were successful because we also set everyone up before hand, but I did two other things as well. First, I planned to take the pictures about a week before I really wanted them. This put ME in a better mood, a more clam state, because I wasn't worried about only getting once chance. Second, we practiced a little bit. In our case, we tried on the glasses almost every day at least once/day before the pictures and I enthusiastically told my son he looked handsome. Oh, I should mention, it also helped that we had two adults during the photo-taking. One to work the props and one to shoot the photos. Orange is my favorite color... just sayin. Lol. And I loved this pin, if I could find a pumpkin large enough to fit either of my kids I would have tried it too. Ha ha. Another thing not mentioned is that the original pins are pictures taken by professional photographers who most likely have expensive DSL cameras and tremendous photo editing skills. The average camera phone or point-n-shoot, no matter how happy your baby might be, will not take a picture that will look anything like the originals, no matter how hard you try. That's my thoughts, from a photography-as-a-hobby person such as myself. 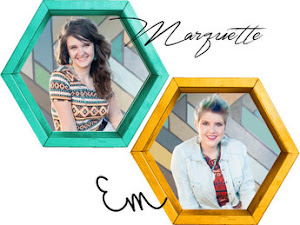 Love the pictures, though! The crying baby was delightfully comical and classic!! Babies are more aware of what's going on than I think a lot of us give them credit. 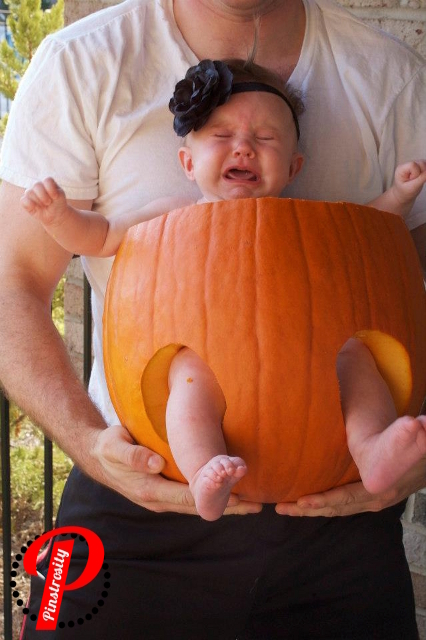 I haven't tried this pumpkin photo, but I would bet that if you let a baby touch and smell and even taste the pumpkin for a few minutes before you put them into it they would be a lot more comfortable with it. Make sure that mom or someone they really trust is the one who puts them in and is within sight at ALL times. Clap for them. Tell them what a good job they're doing and how cute they look. That's my sweet boy in the first original photo! We were shocked he did so well, but what we did was made sure to scrape as much out of the pumpkin as we could so he wouldn't have a bunch of gooey pieces on him, we took the photo inside, left his diaper on...and as you can tell from the photo, him thinking the pumpkin was tasty helped too! We took another photo with another baby after this and we used a blanket for him. But sometimes no amount of preparation or expensive camera will matter if baby isn't happy! Congrats :) Did you upload it as a stock photo? Tried this with my dog...fail! SUGGESTION: Warm the pumpkin ahead of time in a warm oven (~100F), BEFORE adding the kid. I'd try this myself, but don't have a handy small kid around (Heather, Alex, Holly, where are you now that I need you?). Now since this suggestion comes from an Idaho-Licensed Professional Chemical Engineer, you know it is solid, SOUND ADVICE and IN THE PUBLIC INTEREST. My Favorite color is Orange! I love it! But your right... not many people agree... orange is way underrated! Haha that first pinstrosity baby photo was hilarious, that babies face cracked me up! The pictures always look so much easier on Pinterest. In reality it seems to take way more work than you initially thought. For my baby's newborn pics we took off her diaper to get a pic of her cute bum, and she pooped all over! The look of sheer terror and horror of the first pinstrosity totally made my Thursday morning! Thank you. We did this with my baby girl! We didn't use a blanket, but we did leave her diaper on. She LOVED it. No tears until I went to take her out. She didn't want to get out! I did try this shot with my son last year with much success. He had on skeleton jammies on so he didn't have to feel the ick of the pumpkin. That first pinstrosity photo made me Literally LAUGH OUT LOUD!!! That would have so been one of my kids. Well at least they Tried it. The 2nd baby in pumpkin shot is my niece Zoe, and I shot it for iStock. There was Prep work before hand. Inside the pumpkin is a towel that My sister in law just pulled out of the dryer. We had Zoe with her hat on ready to go, fed and happy ... I had already checked my light so I was all set up already camera wise. So the second the towel was placed in the pumpkin, Zoe was placed in there and I started shooting. It still depends on the baby too. I placed my youngest little boy who is about the same age in there, and he wasn't going to have anything to do with it lol. We don't have a place to upload photos here to the actual site, but you are always welcome to send them in to us by email!